Millions of sun-starved Britons should take vitamin D supplements during winter to avoid bone and muscle disease, official new health advice says. People need 10micrograms of vitamin D a day to avoid bone diseases such as rickets, according to a report from the Government’s Scientific Advisory Committee on Nutrition. It is the first time that healthy adults – other than pregnant women and members of high-risk groups – have been advised to take the supplements. During the spring and summer, the skin makes vitamin D when it is exposed to the sun. But in autumn and winter Britain’s weather means most people have to rely on their diet to get enough of the vitamin. They can do that by eating red meat and plenty of oily fish – but the new guidance, published by Public Health England today, suggests millions who do not eat enough of these should take supplements instead. Those who do not get out in summer – the frail or patients in care homes – should take the pills year round. A year’s supply of the vitamins costs around £4 in pharmacies – and they are also available on prescription. Dr Louis Levy, head of nutrition science at PHE, said: ‘A healthy, balanced diet and short bursts of sunshine will mean most people get all the vitamin D they need in spring and summer. Rickets, a bone disease common in Victorian times, and caused by lack of Vitamin D, was virtually eradicated in the 1950s. But cases have more than doubled in the last decade, with some 450 children admitted to hospital with the disease each year. Experts say part of the reason is reduced exposure to sunshine in early childhood due to a lack of outdoor play, and partly due to diets low in vitamin D-rich foods such as oily fish, eggs and liver. 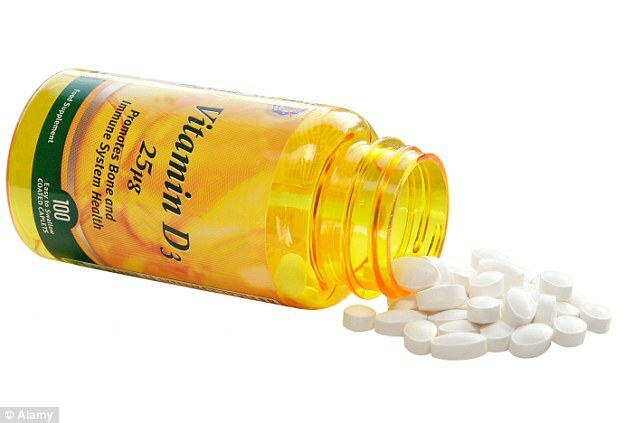 Vitamin D deficiency is also linked to long-term problems such as tooth decay, breathing difficulty, raised risk of infection and heart problems. The new guidance also suggests that babies should get vitamin D drops from birth, rather than the previous advice that said they should only get them from six months.